This annual exhibition features Master’s Thesis work by the 3rd year Master of Fine Arts candidates in the USF School of Art and Art History. 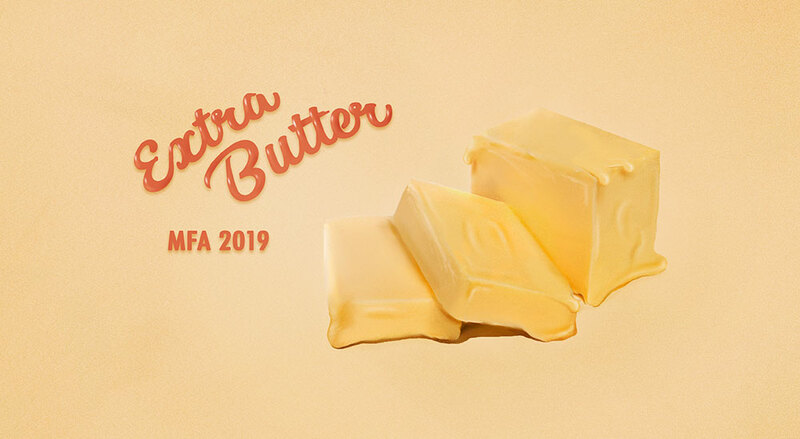 The 2019 MFAs are Pat Blocher, Christian Cortes, Christopher Evans, Muriel Holloway, James Mastroni, Laura Kim Meckling, Carola Miles, Eric Ondina, Jason Pinckard, Taylor O. Thomas, and Jake Troyli. The four international artists in The Visible Turn: Contemporary Artists Confront Political Invisibility, Karolina Sobecka, Bosco Sodi, Tavares Strachan, and Jorge Tacla, will create installations in response to the phenomenon of cultural concealment. They will combine the presentation of objects and performances inside an exhibition venue with artist-directed activities that engage and support communities in the Tampa Bay area affected by political or social invisibility. Together, the works refer to people and ideas that have crucially been omitted from today’s social, political, economic, and cultural processes. According to Duchamp’s logic, invisibility is impotence. What is powerful is to be seen. 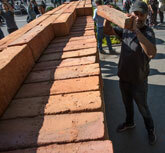 Curated by Christian Viveros-Fauné; organized by USF Contemporary Art Museum. The Stanton Storer Embrace the Arts Foundation is the major supporter of The Visible Turn: Contemporary Artists Confront Political Invisibility. Bosco Sodi, MURO is sponsored by The Gobioff Foundation and USF World. The opening night artist conversation is made possible by the generous support of Dr. Allen Root in honor of his late wife Janet G. Root. Film on the Lawn presented by CAM Club. 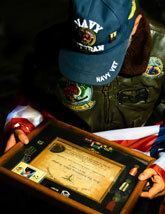 Breaking Barriers: Selected Work presents photographic artworks by USF and Tampa Bay military veterans created in a workshop series led by Photographer Jim Reiman. The exhibition photographs present reflections on self, others and a uniquely shared experience, brought into focus through a lens. Breaking Barriers is a project by USFCAM in collaboration with the USF School of Art and Art History. For three decades, Miki Kratsman has been one of the leading chroniclers of life in the Israeli-occupied territories. His photographs—many of them documentary images taken during a previous life as a press photographer for the Israeli newspapers Hadashot and Haaretz—uncover personal stories while revealing the violent, often detached nature of Israel's military occupation of the West Bank and Gaza. 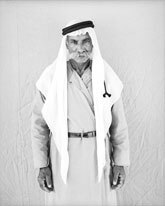 While trying to answer the question “What happened to the people in the photographs?,” Kratsman amassed a vast archive of more than 9,000 portraits of anonymous Palestinians, which he first uploaded onto a dedicated Facebook page in 2011. The USFCAM installation materializes the artist’s growing portrait archive together with identifying commentary that, in some cases, serves as a literal proof of life—or death. People I Met raises questions about the culture of representation and continues the museum’s tradition of presenting challenging artwork with social content. The exhibition also includes a video titled 70 Meters...White T-shirt, and several recent photographic series. Curated by USF Contemporary Art Museum curator-at-large Christian Viveros-Fauné; organized by USFCAM. Exhibition made possible by USF World and The Artis Grant Program. Inspired by the Four Freedoms outlined by Franklin Roosevelt and Norman Rockwell, For Freedoms 50 State Initiative is an anti-partisan, national platform using art as a means for civic engagement, discourse and direct action. The CAM Club invites the community to participate by creating a lawn sign to articulate their own vision of freedom for public display outside the museum. USFCAM’s participation in For Freedoms 50 State Initiative is made possible in part with generous support from the Gobioff Foundation. Raise the Flags presents a selection of artist-designed flags created for Pledges of Allegiance, a nationwide, year-long serialized commission presented by NY-based public art nonprofit Creative Time. As the first institution to participate in Creative Time’s public art initiative to raise the flags at arts, educational, and cultural organizations across the country over the past year, USF Contemporary Art Museum is proud to assemble a selection of flags by acclaimed artists addressing the most pressing issues of our contemporary moment. 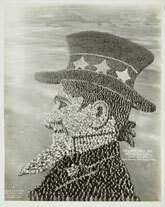 For more information on Pledges of Allegiance, please visit creativetime.org. USFCAM's participation in Pledges of Allegiance is made possible in part with generous support from the Gobioff Foundation. Restricted will display seldom seen but important works from the permanent collection of the USF Contemporary Art Museum, including paintings, prints, video, sculptures, installations, and archival material by leading artists such as Claes Oldenburg, John Cage, Lynda Benglis, Mernet Larsen, Robert Stackhouse, Burt Barr, and many others. All the works are restricted in the environments and contexts in which they can be displayed and this exhibition offers not only the opportunity to view these “hidden gems,” but a discussion of their care and the competing pressures of best museum practices. Students in the VSA Florida My Art My Way program at Jefferson High School present works of art in response to the CAM exhibition Climate Change: Cuba/USA. This annual exhibition features Master’s Thesis work by the 3rd year Master of Fine Arts candidates in the USF School of Art and Art History. The 2018 MFAs are Samir Bernardez, Gloria Ceren, Will Douglas, Ben Galaday, Nestor Caparros Martin, Zakriya Rabani, and Kim Turner-Smith. 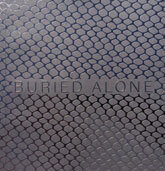 Buried Alone: 2018 MFA Graduation Exhibition is supported in part by the USF School of Art and Art History. Renowned Pop artist James Rosenquist, who passed away earlier this year, lived and worked in the Tampa Bay area for more than four decades. Throughout his life Rosenquist maintained a very active and generous profile within the creative community of Florida’s west coast. From November 13th through December 9th, 2017, the USF Contemporary Art Museum will celebrate this creative and collaborative legacy with the exhibition James Rosenquist: Tampa. Drawn primarily from the collection at USF, the exhibition will feature editions of Rosenquist prints produced at USF's print atelier Graphicstudio. Additionally, the exhibition will include works from private collections, drawings and support materials, and prints produced at three Tampa Bay area ateliers: Flatstone Studio, Pyramid Arts, Ltd. and Topaz Editions. James Rosenquist: Tampa is curated by Peter Foe; organized by USF Contemporary Art Museum. Belgian artist David Claerbout has explored the conceptual framework of duration through use of film and digital photography throughout his career. His skilled manipulation of still and moving images appears to capture another dimension of existence, shifting between past and present. The element of sound is critical in many of his works, used as either a narrative device or a “guide” for the viewer to navigate the architectural space in the film. Claerbout’s oeuvre is characterized by a meticulous attention to production details, painstakingly created often over a period of years. The resultant works are immersive environments in which the viewer is invited to engage both philosophically and aesthetically. Curated by Margaret Miller; organized by USFCAM. Black Pulp! examines evolving perspectives of Black identity in American culture and history from 1912 to 2016 through rare historical printed media shown in dialogue with contemporary works of art. The exhibition highlights works by artists, graphic designers, writers, and publishers in formats ranging from little known comic books to covers for historic books and magazines, to etchings, digital prints, drawings, and media-based works by some of today’s leading artists. Black Pulp! is curated by William Villalongo and Mark Thomas Gibson. 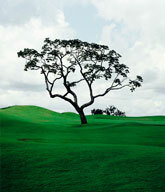 The exhibition tour is organized by International Print Center New York. Black Pulp! and Woke! are supported in part by the USF Institute on Black Life. Woke! brings together recent work by William Villalongo and Mark Thomas Gibson, artists and the curators of Black Pulp! The term “woke” is contemporary American vernacular terminology for acute awareness, particularly in reference to the socio-political contexts we inhabit. Woke! presents works made over the past two years, a time when the influence of the hyper-visuality of police violence upon Black bodies and the cultural currents of the Black Lives Matter movement informed new narratives in their practice. Woke! is organized by USF Contemporary Art Museum. USFCAM presents a solo exhibition of Brooklyn-based artist Duke Riley, known for his ambitious and immersive projects which engage historical and contemporary social issues often through subversive performative action. Flights of Fancy will feature two projects exploring and celebrating Riley’s history of working with pigeons and waterfront districts within the nautical landscape. Curated by Sarah Howard; organized by USFCAM. Duke Riley: Flights of Fancy is supported in part by a grant from the Arts Council of Hillsborough County, Board of County Commissioners, and by the USFCAM Art for Community Engagement (ACE) Fund Patrons: Allison and Robby Adams; Frank E. Duckwall Foundation; Francesca and Richard Forsyth;Gobioff Foundation; Courtney and Jason Kuhn; Linda Saul-Sena and Mark Sena; Sharmila and Vivek Seth; and Stanton Storer. Growing consensus among scientists suggests that we live in a new geological epoch characterized by humankind’s impact on Earth: the Anthropocene. This impact is evidenced in part by remainders of fossil fuel production and consumption, petrochemical use, industrial agriculture and mining. Extracted brings together a group of artists whose work investigates the extraction of natural resources, and the material and cultural circulation of such resources around the globe. Participating artists: Mary Mattingly, Otobong Nkanga, Claire Pentecost, David Zink Yi and Marina Zurkow. 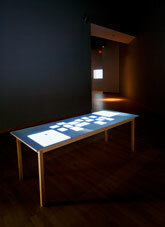 Extracted is curated by Megan Voeller and organized by USFCAM. Claire Pentecost's participation is supported by USFCAM's Art for Community Engagement (ACE) patrons: Sharmila and Vivek Seth, Allison and Robbie Adams, Courtney and Jason Kuhn, Francesca and Richard Forsyth, the Stanton Storer Embrace The Arts Foundation, and the Frank E. Duckwall Foundation. Amplified explores the history, collaborative process, and impact of New Orleans Airlift’s musical architecture project The Music Box, including the recent installation in Sulphur Springs, through video documentation, instrumental elements, performance videos, ephemera and new work by local artists inspired by the project. This exhibition is co-curated by USF Curator of Public Art and Social Practice Sarah Howard and USFCAM Exhibitions Manager and Registrar Shannon Annis and organized by USFCAM. The Music Box: Tampa Bay is supported by a National Endowment for the Arts ART WORKS grant, The Frank E. Duckwall Foundation, The Gobioff Foundation, and the USF School of Art and Art History’s Bank of America Community Arts Endowment Fund. New Orleans Airlift (NOA) artists will create an interactive musical architecture project with local artists and students, in partnership with Community Stepping Stones in Sulphur Springs. The Music Box: Tampa Bay is supported by a National Endowment for the Arts ART WORKS grant, The Frank E. Duckwall Foundation, The Gobioff Foundation, and the USF School of Art and Art History’s Bank of America Community Arts Endowment Fund. 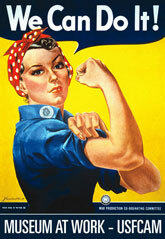 To find out more about how NEA grants impact individuals and communities, visit www.arts.gov. Histórias will showcase works by Jonathas de Andrade, Sonia Gomes, Virginia de Medeiros, Caio Reisewitz, and Luiz Zerbini, whose approaches address the varied histories of Brazil, some collective, some individual, but all rooted in reflections on the country’s complicated past and present, and vast geographical, racial, and cultural wealth and diversity. Curated by USFCAM Curator Noel Smith, with Dr. Agnaldo Farias, University of São Paulo; organized by USF Contemporary Art Museum. Exhibition sponsored in part by a grant from the Arts Council of Hillsborough County and the Board of Hillsborough County Commissioners, the USF Institute for the Study of Latin America and the Caribbean, USF World, and The Gobioff Foundation. Concurrent with Histórias, São Paulo-based artist Sandra Cinto will design a site-specific installation for CAM’s West Gallery. Cinto is known for her dramatic scenarios incorporating water, the night sky and billowing seas, that transform exhibition spaces into places of meditation on the passing of time and the relationship of humans to nature. A Family Affair presents seven artists who explore personal identity and family relationships through photography, video, performance and animation. Adopting a range of approaches from documentary to fiction, they articulate visions of self situated within interpersonal and historical family contexts as well as broader social frameworks of race, class and gender, often working in collaboration with family members to realize their art. A Family Affair is curated by Megan Voeller and organized by USFCAM. 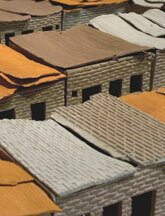 The exhibition catalogue for A Family Affair is supported by a grant from the Elizabeth Firestone Graham Foundation. 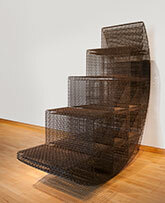 Corine Vermeulen’s residency is supported by Caspers Company and Sharmila and Vivek Seth. With Hidden Noise is an exploration of sound art that asks museum visitors to spend time listening more carefully, revealing the richness of sound in the world. Titled after Marcel Duchamp’s ready-made of a ball of string containing a mysterious sound-making object hidden in its folds, this exhibition brings together evocative sounds, some recognizable from traditional instruments and field recordings, and others masked through electronic processes. With Hidden Noise is curated by Stephen Vitiello, an artist who has worked with sound for over 20 years, transforming anodyne noises into compelling soundscapes. Artists include Vitiello and Taylor Deupree, Jennie C. Jones, Pauline Oliveros, Andrea Parkins, Steve Peters, Steve Roden and Michael J. Schumacher. With Hidden Noise is part of ICI’s Exhibitions in a Box series. 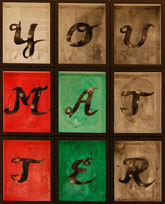 Produced by Independent Curators International (ICI), New York, this exhibition is curated by Stephen Vitiello. With Hidden Noise is made possible, in part, by a grant from the Andy Warhol Foundation for the Visual Arts; the Horace W. Goldsmith Foundation; the Robert Sterling Clark Foundation; and the ICI Board of Trustees. Museum at Work turns the museum inside out by making the USF art collection, and the work associated with managing the collection, visible and accessible to students and visitors. Visitors will view collection artwork displayed in a series of three rotating exhibitions while staff performs various collection care activities in the gallery. Students and visitors will also have the opportunity to participate in free, general admission workshops presented by USFCAM collections staff on photographing artwork, safe storage practices for artwork, framing basics, and an introduction to art installation. For two weeks the public will have a chance to participate in our first crowd-sourced exhibition through CAM's various social media outlets. You may choose what collection works you want to be installed for the final show of the summer in Museum at Work. Museum at Work is organized by the USF Contemporary Art Museum. USFCAM hosts this annual exhibition featuring Master’s research projects by MFA Candidates in the School of Art and Art History. This exhibition provides an opportunity for graduate students to have their work viewed in a professional environment. Enhanced! presents a selection of vintage and contemporary manipulated photographs that span the history of photography. The images selected for the exhibition have been transformed manually and digitally to enhance them in a variety of ways and to fool the eye of the viewer, and to expand and shift our understanding of photography as a medium. Works selected from The Drapkin Collections anchor the exhibition, with classic images dating from the 1850s to the 1960s, including works by Anna Atkins, Harold Edgerton, Alexander Gardner, Gustave Le Gray, Man Ray, Eadweard Muybridge, Jerry Uelsmann, Weegee and many others. Examples of vernacular photography reflect collector Dr. Robert Drapkin’s broad range of interests. Contemporary selections include works by Yoan Capote, James Casebere, Jerome Favre, Adam Fuss, Debbie Grossman, Kalup Linzy, Christian Marclay, Vik Muniz, Yamini Nayar, Roman Signer, and Peter Tscherkassky. Curated by Noel Smith; organized by USF Contemporary Art Museum. Enhanced! is supported in part by a grant from the Arts Council of Hillsborough County and the Board of Hillsborough County Commissioners. Oscar Muñoz’s three-part video installation Sedimentaciones is a poetic meditation on the photographic image and its power to evoke memory, loss and mortality, and to create, alter and erase history. Muñoz (Colombia, 1951) is known for his extensive use of photography and of ephemeral material. In his practice he defies categorization by medium, as he blurs the boundaries between photography, printmaking, drawing, installation, video and sculpture. 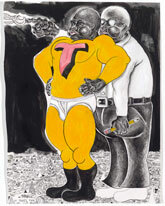 While his work is rooted in the turbulent history of Colombia in the 1980s and 90s, with its guerrilla warfare, conflicts between the government and drug cartels, assassinations and "disappearances" of ordinary citizens, his explorations of the unstable nature of personal identity against the backdrop of history are universal. 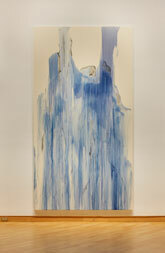 Sedimentaciones is exhibited courtesy of the Ella Fontanals-Cisneros Collection, Miami. Curated by Noel Smith; organized by USF Contemporary Art Museum. Oscar Muñoz: Sedimentaciones is supported in part by a grant from the Arts Council of Hillsborough County and the Board of Hillsborough County Commissioners. Making Sense brings together four artists who make distinctive contributions to contemporary painting. Through a range of approaches, they explore painting as a medium, a set of techniques, an historical institution and a framework for making sense. Inspired by WWII-era Enigma decoding machines, Rochelle Feinstein takes on puzzling figures of speech, inscrutable ideas and encrypted social codes as challenges for painterly representation. Using a method she calls “Random Select,” Deborah Grant creates imagined, non-linear narrative encounters between historical artists, interwoven with her own varied humanistic interests from literature to religion. Iva Gueorguieva adapts the visual language of modern abstraction to create tumultuous, energetic spaces on canvas; her process of building up paintings by layering torn cloth with pigment and color washes produces spontaneous, dynamic compositions rooted in personal stories. Dona Nelson’s two-sided paintings, stained and layered with strands of cheesecloth, invite viewers to encounter them as freestanding forms. Making Sense includes new works produced by Feinstein and Gueorguieva at Graphicstudio, the 45-year-old collaborative printmaking and sculpture atelier of the USF Institute for Research In Art. Curated by Margaret Miller, Director, USF Institute for Research in Art, and Megan Voeller, Associate Curator of Education, USF Contemporary Art Museum; organized by USF Contemporary Art Museum. This exhibition features sculptures by Richard Beckman (1957-2004) from Florida collections. Beckman’s organic and geometric forms in human scale investigate the dynamic balance between mind and body, and the synthesis of this duality through materials and process. 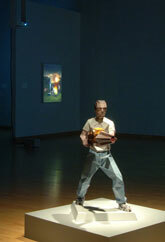 Curated by Sarah Howard, USF Institute for Research in Art; organized by USF Contemporary Art Museum. A Different Frame of Mind presents new work by seven artists that has been produced using recycled picture frames donated by CAM as part of ongoing efforts to find new methods for sharing resources with the Tampa Bay community. Artists were chosen for the quality of their submissions in response to an open call for proposals. Over the course of the exhibition, the West Gallery served several functions: as a studio space where the artists will work, with the public invited to witness the creative process; as a location for framing workshops as the works are enclosed into the recycled frames; and as a traditional viewing space for the duration of the exhibition. A Different Frame of Mind features works by Ariel Baron-Robbins, Mike Covello, Derek Curry and Jennifer Gradecki, David Gabbard, Janet Pulido, and Sam Robinson. Curated by Vincent Kral, USFCAM; organized by USF Contemporary Art Museum. This exhibition of Graphicstudio editions is organized by the USF Contemporary Art Museum, and presented by the Tampa Museum of Art. USFCAM hosts this annual exhibition featuring Master’s research projects by MFA Candidates in the School of Art and Art History. This years artists include John Allen, Emily Elliott, Corbett Fogue, Jennifer Greenwell, Johanna Keefe, Briana Phelps, Mikaela Raquel Williams and Janelle Wisehart. SubRosa examines the language of art across continents and cultures in response to social, political, and environmental repression. Sometimes covertly and dangerously, the artists in SubRosa share a desire to question dominant political systems and the cultural status quo. 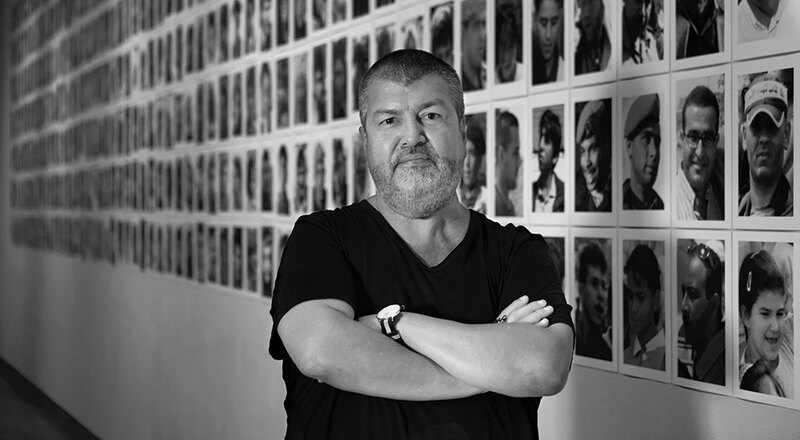 Artists include Ai Weiwei (China), Ramón Esono Ebalé (Equatorial Guinea), Barbad Golshiri (Iran), Khaled Jarrar (Palestine), Zanele Muholi (South Africa), and José Toirac and Meira Marrero (Cuba). Curated by Noel Smith; Organized by USFCAM; Made possible in part by a grant from the National Endowment for the Arts, and supported by the USF Institute on Black Life and EG Justice. SubRosa is also the basis for the latest edition of InsideART, our free web-based visual literacy program integrating secondary school social studies and science with contemporary art in an examination and discussion of critical societal issues. This exhibition of videos by Cuban artists working worldwide invites contemplation of what it means to occupy (a home, a plot of land, a city, a society…) and the relationship between occupying and building and the concept of the work of art in today’s global culture. Three interconnected segments pose the question of how to reinvent a language for imagining what is public, private and intimate in a culture like Cuba’s, where civil society has been supplanted by the State. Concept and Video Curation by Dennys Matos; Exhibition Curated by Noel Smith; Environment by Vanessa Diaz; Organized by USFCAM. Paul O. Robinson is an artist and architect living and teaching in Ljubljana, Slovenia, whose research concerns transformative methods of representation using artifactual and indexial sources. Form of Absence references the work of the Slovene architect Jože Pležnik, known for his abstracted classical forms built in Prague, Vienna and throughout Slovenia. The exhibition proposes that the accessible evidence found in the aftermath of occupation is not always what it seems. Project curated by Robert MacLeod, USF Professor and Director of the School of Architecture and Community Design; organized by USFCAM. Open Score pays homage to artist Robert Rauschenberg and the first in the series of groundbreaking performance art presentations he titled 9 Evenings: Theatre and Engineering, held in 1966 at the Armory in New York City. With its emphasis on the technological aspects of new media, Open Score examines the possibilities these technologies offer as tools for the poetic transformation of reality and the approach to forms of expression in art and daily life. Participating artists include Ingrid Bachmann and Bill Vorn (Canada); Patricia Clark and Barry Moon (USA); Luis Gómez, Antonio Gómez Margolles, and Levi Orta (Cuba); Camilo Martínez and Gabriel Zea (Colombia); and Mariano Sardón (Argentina). Initially curated by Luis Gómez and Dannys Montes de Oca for the 11th Biennial in Havana, Cuba, the Open Score project in the USA is curated by Noel Smith, IRA Curator of Latin American and Caribbean Art, in collaboration with Gómez and Montes de Oca, and is organized by USFCAM. Open Score is supported in part by the Arts Council of Hillsborough County and the Hillsborough County Board of County Commissioners. The Andy Warhol Legacy Project is an exhibition of 106 Polaroids and 50 gelatin silver prints the USF Contemporary Art Museum received in 2008 as a gift from The Andy Warhol Foundation for the Visual Arts, as part of the Andy Warhol Photographic Legacy Program. The portraits, celebrity snapshots, couples, nudes, painting ideas, party photos, still lifes, and outdoor scenes that make up the gift demonstrate the range of Warhol’s interests. The Importance of Being Photographed takes its cue from the gift from The Andy Warhol Foundation for the Visual Arts and Oscar Wilde’s seminal play “The Importance of Being Earnest.” Although separated by an ocean and almost a century, both Warhol and Wilde were interested in examining celebrity, beauty, sexuality, privacy, and despair. The American photographers in this exhibition continue to examine those themes, often revealing a rapport between the artist and his or her subject. Artists include: Tina Barney, Dawoud Bey, Katy Grannan, Jason Lazarus, Malerie Marder, Ryan McGinley, Catherine Opie, and Alec Soth. The Importance of Being Photographed is curated by Jane Simon, USFCAM Curator, and organized by the USF Contemporary Art Museum, Tampa. In Residence brings together the work of four Miami-based artists—Felecia Chizuko Carlisle, Naomi Fisher, Christy Gast, and Samantha Salzinger—who focus artistic inquiries on the contested space between the natural and the built environment. For decades, Miami has been the site of tremendous speculative real estate development, but it is also the southern edge of the famed Florida Everglades, a unique geography and the focus of a vast reclamation project. These artists fold the world around them into complex examinations of the history of art and an evolving understanding of landscape. In Residence is curated by Jane Simon, USFCAM Curator, and organized by the USF Contemporary Art Museum, Tampa. The exhibition features Master’s research project work by Master of Fine Art candidates in the USF School of Art and Art History, and provides an opportunity to have their work viewed by the public, as well as University faculty and colleagues, in a professional environment. Artists include Biff Bolen, Megan Hildebrandt, Jay Hollick, Sarah Kelly, Shane M. Maberry, Forrest MacDonald, Cynthia Mason, Taylor Pilote, Scott Rosenberg, and Serhat Tanyolacar. For decades, Mark Dion has created drawings, prints, cabinets of curiosity, archaeological digs, and sprawling installations about the discrepancy between perceived knowledge and scientific inquiry, between common perception and advanced research. His works have addressed famous intellectuals in history, such as William Bartram, as well as important social and environmental sites, most recently the fragile Florida Everglades. Mark Dion: Troubleshooting is a focused survey of his most ecologically-themed works. Organized by the USF Contemporary Art Museum. The Talent Show explores the competing desires of notoriety and privacy, and the evolving relationship between artists and audiences in our culture of reality television and Web-based social media. For almost half a century, artists have modeled and exploited these desires and dramatized the complex dynamics that surround them, often engaging people to participate in their work—both with and without their knowledge. Artists include: Stanley Brouwn, Chris Burden, Sophie Calle, Peter Campus, Graciela Carnevale, Phil Collins, Philip-Lorca diCorcia, Tehching Hsieh, David Lamelas, Piero Manzoni, Adrian Piper, Amie Siegel, John Smith, Andy Warhol, Gillian Wearing, Hannah Wilke, Shizuka Yokomizo, and Carey Young. 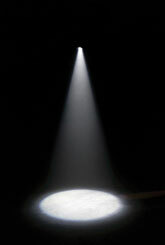 The Talent Show is organized by Walker Art Center, Minneapolis, and is made possible by generous support from the David Teiger Foundation and Ann M. Hatch. The exhibition is curated by Peter Eleey. Stagecraft brings together a group of artists who share an impulse to re-imagine and re-script our relationships to everyday objects and characters. Working with a do-it-yourself directness across the fields of sculpture, theater, performance, cinematography and animation, the artists in Stagecraft delve into absurdity to make the familiar strange once again. In the process, they present us with a skillful meditation on art-making itself. Curated by David Louis Norr; organized by USFCAM. This annual exhibition featuring Master’s Final Project works by MFA Candidates in the USF School of Art and Art History provides an opportunity for graduate students to have their work viewed by the public, as well as University faculty and colleagues, in a professional environment. This year's class includes: Robb Fladry, Ryan Foster, Zak Hemsteger, Lin Li, Francis Marquez, Justin Martin, Bruce Monroe, Daniel Moore, Ellen Mueller, Chris Otten and Jordi Williams. 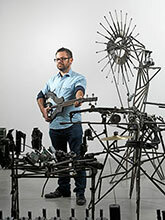 Internationally acclaimed Texas-based artist Trenton Doyle Hancock is best known for his ongoing narrative and theatrical installations that thrust the viewer literally and figuratively into his personal, idiosyncratic, and, at times, heretical weave of words and images. This exhibition features new and selected works executed across a wide variety of media, including drawing, painting, collage, and sculpture. The exhibition also highlights a commissioned wall drawing. 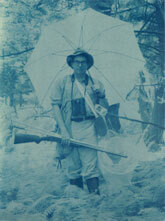 Curated by David Louis Norr, IRA Chief Curator; Organized and circulated by USFCAM. Project is supported, in part, by the National Endowment for the Arts, the Nimoy Foundation, and the Arts Council of Hillsborough County and the Board of Hillsborough County Commissioners. Inspired by the architecture and culture of his native Havana, Carlos Garaicoa explores issues relevant to contemporary society including urbanism, politics, history and human rights. He uses a variety of materials and techniques that incorporate drawing, photography, sculpture and text in dramatic, large-scale installations as well as precious miniatures. Garaicoa was born in Havana in 1967 and currently lives and works between Havana and Madrid. Co-curated by Noel Smith, IRA Curator of Latin American and Caribbean Art, and Corina Matamoros, Curator of Contemporary Cuban Art, National Museum of Fine Arts, Havana, Cuba. Organized by USFCAM, and available for travel. Carlos Garaicoa is supported, in part, by the SEA Foundation, Inc., the USF Cuban American Student Association (CASA), and the USF Institute for the Study of Latin America and the Caribbean (ISLAC). Broadcast explores ways in which artists since the late 1960s have engaged, critiqued, and inserted themselves into official channels of broadcast television and radio. 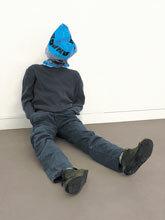 The exhibition features works in a variety of media by an international group of artists: Dara Birnbaum, Chris Burden, Gregory Green, Doug Hall, Chip Lord and Jody Procter, Christian Jankowski, Iñigo Manglano-Ovalle, neurotransmitter, Antonio Muntadas, Nam June Paik, TVTV/Top Value Television and Siebren Versteeg. Broadcast is a traveling exhibition co-organized by the Contemporary Museum, Baltimore, and iCI (Independent Curators International), New York, and circulated by iCI. The guest curator is Irene Hofmann. The exhibition and tour are made possible, in part, with support from the iCI Exhibition Partners. The exhibition features artworks in a variety of media that reflect the research interests of these seven graduating MFA candidates from the School of Art and Art History: Ariel Baron-Robbins, Toni Danette Billick, Maxim Maximovitch, Andrew Nigon, Victoria Lee Skelly, Stead Thomas, and Carmen Tiffany. New Weather brings together the monumental sculptures of Diana Al-Hadid, the turbulent paintings of Iva Gueorguieva, and the enigmatic drawings of Robyn O’Neil. Their works explore the atmospheres and forces, which characterize our time, presenting us with an apt metaphor for the unpredictability of a rapidly changing world. Curated by IRA Chief Curator David Louis Norr; organized by USFCAM. Fernández is internationally known for her immersive installations and evocative large-scale sculptures that address space, light, and the perception of change. The exhibition will present a spectrum of the artist's most recent and ambitious projects. Curated by IRA Chief Curator David Norr; Organized and traveled by USFCAM. What do museums do behind closed doors? Visit CAM this summer when the museum opens its doors to the public to see the process for photographing and documenting the collection with Peter Foe, Curator of the Collection. 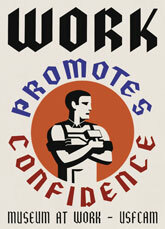 See what really happens, participate in the project and explore the collection online at CAM’s Collection kiosk. The program features videos by artists Olaf Breuning, Kate Gilmore, Luis Gispert, and William Villalongo, alongside interview based profiles with each artist. SIXTY MINUTES is conceived to expose the diversity and complexity of artists’ process and provide an inspiring critical space to research, analyze and debate contexts for practice now and in the future. Sixty Minutes is curated by David Norr, Chief Curator for the Institute. The exhibition features Master’s research project work by Master of Fine Art candidates in the USF School of Art and Art History. This exhibition gives the graduating students an opportunity to have their work viewed by the public, as well as University faculty and colleagues, in a professional environment. Artists include Kimberly Adams, Jeremy Chandler, April Childers, Rebecca Flanders, Chad Harmon, Shane Hoffman, Lauren Howard, James Reiman, Ivan Reyes-Garcia, Marta Slaughter, Jonathan Vaughan and Wesley Wetherington. Raw Loop is the first US solo exhibition of works by Austrian artist Werner Reiterer. The exhibition features drawings, objects and participatory installations that engage the viewer in a re-examination of everyday experience that makes us think and often smile. Curated by Julien Robson, Speed Art Museum. Organized by the consortium of participating institutions, including USFCAM. The Faculty Focus exhibition series highlights the recent work of artists on the studio faculty from the USF School of Art and Art History. Audience & Avatar brings together an international group of artists who explore diverse ways in which videogames, game culture, technology and psychology influence participation of the viewer in art. 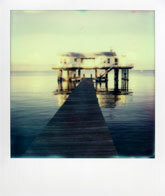 Artists include: John Paul Bichard, Damiano Colacito, Jon Haddock, Eva and Franco Mattes (a.k.a. 0100101110101101.ORG), Eddo Stern and Phillip Toledano. Curated by Don Fuller and organized by CAM. Brody Condon is a New York-based artist who uses game development tools, online games, sculpture, live performers and found footage as performance surrogates blurring the boundary between fantasy and reality. For his project gallery Modifications in Audience & Avatar he uses game technology to re-imagine late medieval religious paintings into self-running games simultaneously implying and denying interaction. MashUp is a group exhibition that traces the history of destruction as a creative force in visual art, and its resonance in the mass culture realm of popular music. Inflicting damage for audio effect and visual ends, MashUp features newly commissioned installations by artists Pedro Reyes and Ted Riederer—plus, an historical array of art and artifacts dating from the 1960s-on by Czech Fluxus “Broken Music” pioneer Milan Knížák, The Art Guys, Christian Marclay and The Plasmatics. Guest Curated by Jade Dellinger, and organized by CAM. One Degree Celsius is part a series of projects called Molecular Urbanism developed by Torolab, a Tijuana-based consortium of artists, architects and designers. For USFCAM the artist collective morphs the gallery space into an actual proposal and a laboratory for creative experiments investigating the multiple uses of a garden. The exhibition includes drawn proposals for large-scale architectural interventions (on the USF campus and downtown Tampa), displayed with functional sculptural elements. This commissioned museum installation is staged in conjunction with the colloquium Art as a Catalyst for Social Transformation and Film Screenings: Socially-Engaged Artistic Practices. Robert Rauschenberg (1925-2008) created over 50 editions of prints, sculptures and photographs with USF’s Graphicstudio from 1972 through 1987. 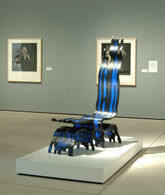 The exhibition includes selected works from USF and area collectors. 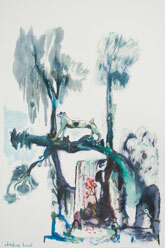 Roger Palmer: In Dog Light is an exhibition of selected drawings (2003–2008) by Tampa-based artist Roger Palmer. Palmer’s brush, wash and ink drawings are darkly humorous meditations on humanity’s foibles and actualities. Anthropomorphic animals, local flora and fauna and technologies of modern man such as cannons and fire trucks unfold in pure-pigment amalgamations of word and image. The USF Contemporary Art Museum will host an exhibition featuring Master’s theses work by MFA Candidates in the School of Art and Art History. This exhibition will give the graduating students an opportunity to have their theses work viewed by the public, as well as University faculty and colleagues, in a professional environment. Cameron Gainer is a New York-based artist whose work explores the presence and power of photography in contemporary culture, particularly how a photograph can catalyze belief and disbelief. The exhibition brings together three large-scale sculptural works including a new commission on view at CAM, and installations at the USF Botanical Gardens and USF Riverfront Park. The two outdoor works are based on 20th century alleged hoaxes that Gainer sites and models from photographic sources; often the only form of evidence that sightings actually occurred. Moving Thought is an art bookmobile project by the graduate students of the USF School of Art and Art History. Each year a nationally recognized juror (critic, artist, curator) selects the works and designates the scholarship awards donated by area corporations, cultural institutions and private patrons. This year's juror is Anne Pasternak, President and Artistic Director of Creative Time, New York City. In 1993, distinguished USF alumnus and artist Robert Stackhouse designated USF Contemporary Art Museum as the archive for his editioned works. USFCAM celebrates this gift with the publication of a catalogue for the Robert Stackhouse Editions Archive and an exhibition of work selected from the archive. This exhibition explores the evolution of Stackhouse’s work from his first print to the most recent editions, his relationship with various print workshops and the interaction across media of his prints, paintings and sculpture. Curated by Peter Foe and organized by the USFCAM. Faculty Focus Exhibition: John Byrd, Gregory Green and Julie Weitz use painting, sculpture and installation to explore themes and the aesthetics of violence, danger and empowerment embedded in politics and popular culture. Homing Devices is a group exhibition that considers the way contemporary Latin American and Caribbean sculptors—who may live and work anywhere in the world—approach the idea of home in context of increasing globalization, mobility, exile and migration in the Americas. By including works that are accented but not defined or delimited by cultural, geographical, and national boundaries, the exhibition considers the vital question of how art and artists preserve their identity within a global landscape. Elsewhere explores the familiar and often tragic theme of the quest. The artists included in this exhibition embark upon quixotic adventures to both real and imagined places - at times edging on the ridiculous, treacherous, and sublime. Pulling from sources as varied as Victorian expeditions, romantic tourism, travel literature, and Hollywood films, the artists in Elsewhere blend documentary styles with found footage, tableaux, and performance into potent mixtures of fact, fantasy, and feeling. To this end, they employ strategies of displacement, re-enactment, and repetition in an effort to erode the temporal boundaries implicit to existing representations of histories, identities, and geographies. StereoVision, an interdisciplinary museum project, gazes simultaneously at the past, present and future as it proposes a glimpse at ways art and technology shape our vision and perception. Stereographs, a 19th century groundbreaking historical antecedent of virtual reality, are joined with contemporary works that make use of perspective, features of virtual reality and immersive environments to probe and disturb our normative visual, auditory, and kinetic perceptive experiences. This premiere of the Master of Fine Arts Graduation Exhibition at the USF Contemporary Art Museum features diverse artworks by twelve artists from the nationally ranked studio art program at USF. Each year, a nationally recognized juror (critic, artist, curator) selects the works and designates the scholarship awards, which are donated by area corporations, cultural institutions and private patrons. Past jurors include notables Marcia Tucker, Roberta Smith, Sue Coe, The Guerilla Girls, The Art Guys, Elyse Goldberg and Jerry Saltz. We are pleased to have exiled Haitian painter and sculptor Edouard Duval-Carrié as the juror for the 31st Student Exhibition. The Trisha Brown Dance Company has presented the work of its legendary artistic director for 35 years. In addition to dance, Brown is known for her work in the visual arts, including improvisational works combining dance and drawing, and collaborations with artists including Robert Rauschenberg, John Cage, Laurie Anderson and Terry Winters. Trisha Brown: Drawing on Land and Air will present Brown’s new improvisational drawings, a selection of collaborative works with artists, and new prints commissioned by Graphicstudio. South African artist Berni Searle, whose work was included in the group exhibition with eight contemporaries in 2002 at USF CAM, The Field’s Edge: Africa / Diaspora / Lens, will be in residence at Graphicstudio to create a newly commissioned work for her solo exhibition. Searle, known for her performances, photography and video work, addresses issues of race, gender and social history, came to the public’s attention in 1997 with an installation that was an important component at the 2nd Johannesburg Biennale, based at the Castle of Good Hope in Cape Town, where she lives and works. Searle creates noteworthy projects that serve as a continuing series of ongoing explorations of identity and self-representation. Since the mid-1990s, Brazilian artist Vik Muniz has been making an international impact with his photographs documenting images he has made in an astonishing variety of non-art, often ephemeral materials, including dirt, sugar, wire, string, chocolate syrup, peanut butter, fake blood, color chips, the circular paper remnants made by hole punches, and diamonds. Muniz’ images are at once familiar—they are often of recognizable news images, works from art history, or well-known personages—and alien: after an initial moment or recognition, it quickly becomes clear that these images are not what they first seemed. Each year, a nationally recognized juror (critic, artist, curator) selects the works and designates the scholarship awards, which are donated by area corporations, cultural institutions and private patrons. This year artist Claudi X. Valdeswill will juror and give a talk. Past jurors include notables Marcia Tucker, Roberta Smith, Sue Coe, The Guerilla Girls, The Art Guys, Elyse Goldberg and Jerry Saltz. 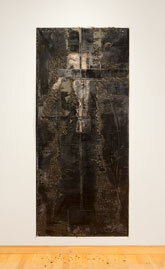 Dragon Veins surveys a variety of ways in which traditional East Asian art informs contemporary painting. The twelve artists idiosyncratically mine East Asian traditions of Chinese landscape painting, Buddhism, ukiyo-e, emaki, bunraku, nihon-ga and kazari, intermixing them with current political events, hip-hop culture, geological maps, modernist abstraction, bodily experience, Dr. Seuss, anime, Post-Impressionism and more. Beautiful Losers: Contemporary Art and Street Culture is an exhibition of multi-media art and design that explores the recent work of a diverse group of visual artists that have emerged from aspects of street culture loosely organized around the subcultures of skateboarding, graffiti, punk, and hip-hop in urban U.S. cities. The exhibition includes painting, sculpture, photography, film, video and performance by thirty individuals who have emerged over the last decade. AudioFiles brings together converging elements of the spectrum of Sound Art. Artists Céleste Boursier-Mougenot, Christian Marclay and Stephen Vitiello create three individually engaging and enigmatic sonic installations, which defy convention and resist categorization. The exhibit represents an emerging and provocative art form by drawing connections between artist modalities and experimental media. Los Carpinteros: Inventing the World is the first major museum exhibition to survey the work of the Cuban collective Los Carpinteros (The Carpenters). 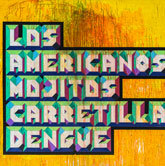 This mid-career retrospective will include a selection of drawings, paintings, prints, installations and sculptures, and be a significant part of the ARTE celebration of Latin American and Caribbean cultures being hosted by the city of Tampa, the USF College of The Arts, and other cultural institutions. This eagerly awaited exhibition features the work of undergraduate and graduate students at the School of Art & Art History, and is juried by a nationally recognized artist, curator, critic or museum professional. Works include a variety of media: ceramics, drawing, painting, sculpture, mixed media, photography, and video. Awards for the students are provided by area corporations, cultural institutions and private patrons of the arts, and designated by the juror. Through drawing, Katz first denotes that which he finds provocative. Then he builds upon his sketched lines through more steps that both enlarge and refine the line. 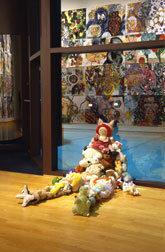 The exhibition in the East Gallery is composed of cartoons and drawings, guest curated by Michael Klein. The West Gallery features a selection of related prints and paintings. The triennial USF School of Art & Art History Studio Faculty Exhibition provides faculty members time to develop new ideas and serves to showcase projects by new studio faculty. A diverse selection of work is represented: painting, photography, printmaking, sculpture, ceramics, film, video, new media and performance projects. New York based artist Burt Barr has been making video-works since the 80s. At CAM he will show a series of video projections, all with water as an element, produced from 1999–2004. New York and Brazil based artist Janaina Tschäpe works in a variety of media including drawing, photography, film and installation. For CAM, Tschäpe developed a new high definition video installation filmed at Weeki Wachee Springs, Florida. This loosely defined group of area artists describes itself as an “uncomfortable alliance” – ambitious, obsessed, over-reaching, critical and self-effacing. 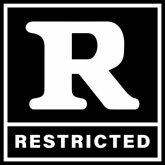 Each member is engaged in radically different vocabularies and strategies – with a preoccupation of “badness”. The group’s sub-composition is made up of “the Fluff Constructivists” – Mikel Durlam, Ethan Kruszka and Jon Peterson; others include Matthew Guest, Rachel Hoffman and John McGrane. Memorial exhibition of paintings by Jose Marin, USF School of Art Alumnus and one of the founders of the Tampa-based collaborative group, titanic anatomy, inc.
For the 28th year, USF students are given the opportunity to enter their art in an exhibtion juried by Allan McCollum, an internationally known artist. Awards are donated by community businesses and museum supporters. This exhibition of photography relies on a number of sources, including works published by Graphicstudio, the collections of other cultural institutions and private individuals, most notably Tampa collector Dr. Robert Drapkin. Vintage and contemporary works will be installed together, exploring the history of photography. In conjunction with the USF CAM exhibition, Graphicstudio will house a didactic exhibit of the apparatus and methods involved in the fabrication and printing of photographs. Techniques represented include: ambrotype, tintype, albumen, salt, calotype, cyanotype, stereoscope in paper, tissue and glass, gum prints, and silver gelatin. The Institute for Research in Art and Office of Research at USF bring the arts and sciences together to celebrate research and the 50th anniversary of the discovery of DNA, with a special solo-night of projected images created by artists, scientists, architects and designers, featured throughout the USF CAM. 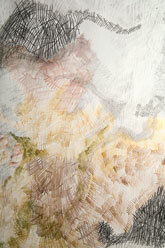 The works from the juried exhibition are available online here. The exhibition is sponsored by the IRA and Office of Research; juried by Eduardo Kac. San Francisco-based artist Jim Campbell comes from a technical background in engineering - he holds two Bachelor of Science degrees in Mathematics and Engineering from MIT - and an artistic background in filmmaking. Campbell creates fascinating, interactive, electronic works and installations that involve the viewer and the viewer's response to a given situation. Walk Ways brings together a diverse group of contemporary artists who have focused on the theme of walking, a purposeful or meandering activity that unites physical and mental freedom. Walking - like breathing - is a basic act which is its own expression. The 19 artists in this exhibition have used the walk as a means of exploring notions of work, leisure, politics, geography and identity. Informed by their own experiences as well as examples from literature and art history, these artists have created works about and by walking. Trespassing is an exhibition about house designs by nine contemporary artists in collaboration with the New York architectural firm, OpenOffice. The projects are presented through a variety of strategies including architectural models, text writings and interviews, conceptual sketches, digital media and partial and/or full-scale realizations. Students, faculty, staff, alumni and the arts community are invited to gather for a rare event recognizing the accomplishments of the School of Art & Art History’s retiring faculty. With Exeunt Omnes — Latin for ‘all exit’, commonly used in theatre as a stage direction — we will be highlighting the historic contributions that Alan Eaker, Diane Elmeer, Chuck Fager, Bob Gelinas, Jeffrey Kronsnoble, Mernet Larsen, Bruce Marsh and Theo Wujcik, have made to the University of South Florida and people of the Tampa Bay area. For the 27th year, USF students are given the opportunity to enter their art in an exhibtion juried by a nationally known gallerist, museum professional, or artist. Awards are donated by community businesses and museum supporters. UnNaturally features over 40 visually stunning works by fifteen artists who employ artificial materials to create simulations of nature that explore the frequently blurred boundary between culture and our environment. Traveled by ICI, New York. The Field's Edge is a multimedia exhibition that explores the relationship between contemporary art and colonial ethnography, most notably the legacy of colonial ethnography on readings of contemporary art from Africa and the Diaspora. The visual exploration of this often contested relationship between art and ethnography focuses on major themes around the politics of narrative and domestic life. Sponsored in part by the National Endowment for the Arts, Florida Department of State, Division of Cultural Affairs and the Florida Arts Council, and the Rockefeller Foundation. 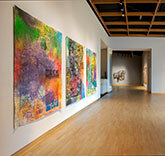 Approximately every three years, the USF CAM hosts an exhibition of Art Department faculty work. This schedule allows faculty members to develop new ideas in anticipation of the show, and also serves to showcase projects by new studio faculty. A diverse selection of work is represented: painting, photography, print making, sculpture, ceramics, film, video as well as digital and new media projects. 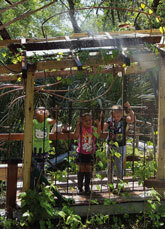 New project by USF Alumni Sharon Engelstein and Aaron Parazette, specifically designed for CAM. Engelstein, known for her "inflatable" sculptures will collaborate with Parazette, who creates colorful wall paintings, to produce an exciting installation. Houston-based artists Sharon Engelstein and Aaron Parazette will co-curate an exhibition that features the work of other Houston artists that share their ideas and working methodologies. A significant artist, curator or art critic will be invited to select works for the annual student show. Undergraduate and graduate students and the community have the opportunity to have their work evaluated by a visiting art professional. Outside of the Box features recent work by leading international artists who not only think differently about subject and content, but propose unconventional modes of presentation for their video-based art. These artists extend video beyond the television monitor and often outside of traditional exhibition spaces. Artists include: Ron Athey, Jim Campbell, Maria Marshall, Mariko Mori, Tony Oursler, Chris Cunningham, Wolfgang Staehle, Daniel Pflumm and Sam Taylor-Wood. USF CAM is pleased to present a new video installation and public billboard project by Carlos Amorales: Fighting Evil (with style), based on the popular Lucha Libre (professional wrestling) of the artist's native Mexico. "Wherever Carlos Amorales is, there's name-calling, viscous threats, gambling, and bloodthirsty crowds all steeped with the anticipation of violence. And the gallery doors haven't even opened yet. Inside, Amorales is preparing his fight for justice." Orta's project for USF includes her collaborations with Metropolitan Ministries in Tampa and a new architectural infrastructure for a modular social space. The Walt Disney Company has made a business of creating entertainment narratives and consumer desire since 1929. Its lexicon of popular icons, combined with fantasy spaces that make up the Disney theme parks, has become an entire vernacular culture. Disney has become synonymous with "American" culture. This exhibition featues the work of artists from diverse cultural backgrounds that reflect the effect of Disney's influence. As Disney continues to create fictional characters and places, the work of these 17 contemporary artists portray imaginary world and question the relationship of the real to the unreal. The exhibition is curated by Omar Lopez-Chahoud, Independent Curator and traveled by University Galleries of Florida Atlantic University, Boca Raton. This fascinating exhibition presents the work of 16 Cuban artists of the 1990s who explore irony as a strategy for psychological survival and oblique commentary. Embedded in their art is the notion that when political and personal problems are inescapable, humor may be one of the few outlets for the frustration, and a practical means to maintain stability within a context that appears at times to be rules by irrationality. The works reflect various views of the 1959 revolution and the realities of life in Cuba under the United Sates embargo. 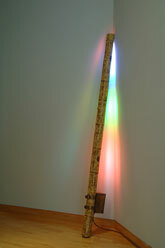 The artists work speculates on Cuba's complex past, its cultural uniqueness as a nexus of African, European and Asian cultures and exemplifies the concept of inventando, the improvisation and creative resourcefulness required for everyday survival. The exhibition is curated by Marilyn Zeitlin, Director of Arizona State University Art Museum in Tempe, and traveled by Independent Curators International (ICI), New York. Union is James Kevin Dowdee, Heather Cushman-Dowdee, Jason Irwin, Carole Loeffler, and Shane M. Richardson, Union is cohesive cell of current USF MFA students who address issues ranging from the spiritual to the political. Annual exhibition showcasing the work of graduate and undergraduate students in all media. The show is juried by a nationally recognized artist, critic, gallery or museum professional and is supported by the USF CAM, Art Department and the student organization, the Fine Arts Forum. William Wegman: Fashion Photographs is a solo exhibition featuring his famous Weimaraners, photographed in couture provided by Saks Fifth Avenue, curated by David Moos and Mary Dinaburg, organized by the Birmingham Museum of Art. Drawings, Photographs and Videos: 1970–2000 is a selection of the artist's videos, films, prints, photographs and drawings curated by Margaret Miller and Peter Foe, organized by University of South Florida Contemporary Art Museum. 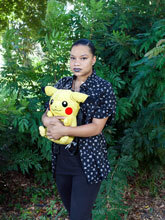 USF CAM has commissioned a new installation by Australian Aboriginal artist Fiona Foley. Didactic exhibitions of traditional Aboriginal bark paintings and Native American beadwork and headdresses, on loan from private collections, will complement the project. The installation will serve as a performance site for guest dancers and musicians being produced by Gretchen Warren, USF Professor of Dance. The exhibition will be the starting point for twelve performances, which will move with the audience to the adjacent Theatre. Edward Ruscha has not only been an influential voice in post-war American Painting, but also one of contemporary art's most significant graphic arts. The Walker Art Center has organized a major exhibition of Ruscha's editions that include artist books and prints from 1962 through 1999. This exhibition will have particular resonance for the Tampa Bay community, as Ruscha was a featured guest artist with USF's fine art atelier Graphicstudio in 1970. The University of South Florida Art Collection features over 3,600 works, many of them by internationally renowned artists such as John Chamberlain, Roy Lichtenstein, Nancy Graves, James Rosenquist and Robert Rauschenberg. 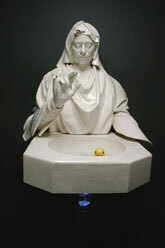 This exhibition will feature watershed works from the collection, as well as special works on loan by artists. This exhibition of collaborative works by poet Robert Creeley and noted artists of our time affirms and celebrates the importance of cross-disciplinary art forms. The show features over sixty projects beginning in the 50s and ending up in 1997, in the form of prints, drawings, photographs, mixed-media works and books. 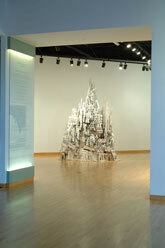 The exhibition is organized by the Castellani Art Museum of Niagra University, New York. This annual exhibition of student work is very much anticipated and enjoyed by both the exhibiting artists and the community. The show provides an opportunity for student artists to have their work professionally presented within the Contemporary Art Museum. The show is juried by a nationally recognized artist, critic, gallery or museum professional, who is selected by students who are members of the Fine Arts student organization, the Fine Art Forum. This exhibit was curated by Las Vegas-based art and culture critic Dave Hickey. Hickey selected eleven artists from the Las Vegas and Los Angeles communities to reclaim the puritanical exhibition space of a museum as a "social space"–space where people might actually enjoy spending time and being together. The iconography of this reclamation is derived from post hip-hop lounge culture, with its infrastructure of raves, clubs, bands, net sites and 'zines. Artists include: Jane Callister, Phil Argent, Tim Bavington (Britain); Christine Seimens, Wayne Littlejohn (Canada); Yek Wong (Singapore); Aaron Baker, Cynthia Chan, Jack Hallberg, Jennifer Steinkamp and Mary Warner (United States). The USF CAM is pleased to host concurrent exhibitions of recent works by USF Art Department studio faculty and selected Art Department Alumni. A diverse selection of work will be represented: painting, photography, printmaking, sculpture, ceramics and video, as well as digital and new media projects. This exciting exhibition represents 16 artists from Argentina, Brazil, Columbia and Venezuela that explore current artistic, political and cultural discourses taking place in South America. Curated by Christopher Grimes of Los Angeles, the show will also consider the idea of South America as a forgotten continent (as the title suggests) within the context of the Western art world, and how issues are still formed, shaped and processed through a colonial history. Sarasota-based artist Leslie Lerner will present a fascinating, multimedia exhibition that includes paintings, 3-dimensional architectural forms, prints and texts. Lerner's work is a series of complex, visual narratives that transport the viewer into an imaginary world full of both contemporary and historical references. His images are a montage of canonical pictorial sources that reference Dutch, French Rococo and American Realist paintings. 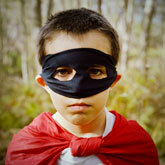 USF CAM is proud to host this annual exhibition of student works. Submissions in all media are welcome. Prize monies are contributed by community patrons and businesses. An exhibition of new work by the Dutch Atelier van Lieshout organized by CAM Director Margaret Miller and New York-based independent curator Jade Dellinger. Joep van Lieshout applies a hybrid sensibility to his popular sculptures, blending a cool jumble of stream-lined, curvilinear molds with occasional dashes of wit. ART IN THE NEWS was a year-long exhibition of artworks designed for the newspaper medium. The project was curated by Margaret Miller, Director of USF CAM and Jade Dellinger, Independent Curator. Twelve artists were invited to design a work to appear one Sunday a month from January to December, 1999. Artist's talks were scheduled in conjunction with each project. This show is the result of a collaboration between Tampa's Museum of Science and Industry (MOSI) and USF CAM to organize and produce a major new exhibition by the reknowned American artist, Allan McCollum. CAM will present an installation of fulgurites (glass objects that are formed when lightning strikes and fuses sand), and MOSI will create a permanent exhibition on triggered lightning. Sponsored in part by The Arts Council of Hillsborough County and The Tampa Tribune. Click here to view the Supplemental Didactics. 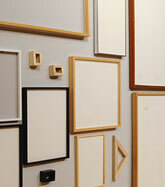 Freeze Frame features the work of 17 artists from Austria, Switzerland, Slovenia, Haiti, Venezuela and the United States. Selected by Viennese Curator Grita Insam, the works are based on classical cinema of various epochs, as well as experimental and documentary film. Curated by USF CAM Director Margaret Miller and New York-based independent curator Jade Dellinger for the 1997 Ljubljana Biennial of Graphic Arts in Slovenia, this exhibition returns to the U.S. for its American premier. This was the first major exhibition in the United States of lyrical, abstract watercolors and prints by this leading German artist. The exhibition, curated by USF CAM Director Margaret Miller, will be on display in CAM and at Graphicstudio/The Institute for Research in Art. An exhibition of works by Professor Emeritus Harrison Covington, former Dean of the USF College of Fine Arts. USF CAM is proud to host this annual exhibition of student works. Submissions in all media are curated by New York-based Gallerist and Collector Todd Leven. Prize monies are contributed by community patrons and businesses. Tim Rollins & K.O.S. emerged from a high school art education setting to establish themselves as an internationally renowned art group. This exhibit was held in conjunction with the dedication of the Tim Rollins & K.O.S. public art commission for USF's new College of Education building. The five artists in this exhibition were commissioned to use their own vocabulary to translate the voices of their collaborators, elderly storytellers living in long term care facilities and aspiring young artists from local youth groups. An exciting exhibition of work by African artists practicing in the international contemporary art world. The show was organized by the Contemporary Art Museum in collaboration with the Museum of African American Art, Tampa.